This is the first in a three-part series examining California’s approach to education data and school accountability. Part Two explores how the elimination of certain data systems has limited educational research in one of the country’s most consequential states. Part Three will consider what the next era of accountability in California might look like under the new federal K–12 education law. His point is that efforts to quantify education are doomed to fall short because of the inherent complexity, necessity of human judgment, and subjectivity of “correct” answers. It’s a view that seems to have deeply shaped Brown’s ideology, and by extension California’s public schools, which serve over six million students in grades K-12. During his tenure, Brown has been one of the foremost critics of federally driven efforts to use data to improve education — and one of the most effective. If Washington, D.C., went to one extreme, in focusing on test-driven accountability policies, as some argue, California has gone to the other: placing a lengthy pause on school accountability, devolving control to local districts, eliminating certain data systems, and declining to tie teacher evaluations to student test scores. Challenging the wisdom of Washington, D.C.
Jerry Brown, a Democrat and son of a former California governor, was first elected to that office himself in 1974, serving two terms, but later failing in three runs for president and a campaign for U.S. Senate. By 1999, setting his ambitions lower, Brown had become Oakland’s mayor, and then in 2007, the state’s attorney general. While the federal government, under Duncan and his boss, President Obama, has been a strong backer of using test scores to judge teachers and schools, California, under Brown, has moved sharply in the opposite direction. In 2013, as California was implementing the Common Core, Brown signed a law suspending the state’s testing and school-rating system; the bill was backed by the state teachers unions and Tom Torlakson, the state schools superintendent. The new policy meant students would take field tests not designed to track their individual growth; in fact, data from the tests would not be shared publicly whatsoever. Duncan said this was a violation of federal law, and threatened to withhold funding, in a dispute that would last months. Eventually Brown would win the game of chicken with Duncan, whose department caved, promising not to pull federal money, which would have meant cutting off over a billion dollars, largely to districts serving poor students, and from a state that carried huge weight in the Democratic party. California extended the school rating moratorium in 2015 — meaning the Golden State has not had a comprehensive school rating or consequential accountability system for three years. The state is now working to design a new system that will comply with the federal education law, the Every Student Succeeds Act (ESSA), adopted last year. This new procedure will not be ready until the 2017–18 school year, a California State Board of Education spokesperson said. The state has also bucked national trends on teacher evaluations. Spurred by federal incentives, the vast majority of states require student test scores to be a part of teacher evaluations, as of last year1. California was one of just five states that put no such condition on teacher performance ratings2. Meanwhile, a rogue group of several large districts in California promised to evaluate teachers based in part on student achievement and build more robust data systems. This led the federal government to award those California outliers a waiver from No Child Left Behind, a move opposed by Torlakson and the state teachers unions. The state teachers unions have generally backed Brown’s approach on testing and accountability. 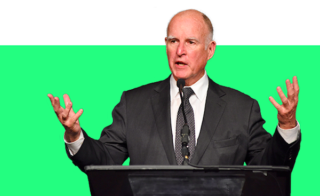 The larger, 325,000-member California Teachers Association (CTA) has supported Brown’s gubernatorial campaigns, endorsing him in 2010 and 2014, and backing him with over $6 million in independent contributions in his 2010 election. A CTA spokesperson declined to comment. But Brown is not easily categorized. Like Duncan, he has generally embraced charter schools, which in some ways epitomize his view of expanding local autonomy and innovation, but are viewed negatively by many teachers unions. Brown started two of his own charter schools in Oakland, as mayor, even writing a commentary about them for the journal Education Next. As governor he vetoed a union-backed bill that would have been banned for-profit charter operators. While opposing Washington’s data-driven reforms, Brown also set about pushing his own proactive education agenda: reworking school funding so that districts had more flexibility over how money is spent, with extra resources going to higher-needs students. This was lauded by many, including some who have been critical of Brown’s approach to data. “[LCFF] represented a massive equity investment — we were talking about actually making sure that the resources were generated [for] high-needs kids,” said Samantha Tran of Children Now, a nonprofit advocacy group in California. But ensuring state money reaches and genuinely helps its intended target has proved challenging. A series of reports by groups that backed LCFF say it’s unclear how districts are spending state dollars and that the fiscal data hasn’t been transparent. After complaints from advocates, the state recently ruled that the Los Angeles Unified School District had defied spending rules and would need to redirect hundreds of millions of dollars to its most disadvantaged students. It then granted the district a one-year reprieve. “Districts are not fulfilling the transparency requirements of how they are increasing and improving services to high-needs students,” said John Affeldt, of the nonprofit law firm Public Advocates, which produced one of the studies. And the documents for spending, called Local Control and Accountability Plan or LCAPs, often run hundreds of pages, morphing into the very same bureaucratic, compliance-driven exercises that Brown said plagued top-down accountability systems. “The plans just became really cumbersome, so it’s hard for anybody to understand; it’s not a transparent plan,” said Peter Birdsall, executive director of the California County Superintendents, whose members review districts’ LCAPs. Still others worry that the new system is too light on accountability “To me, the ‘A’ in ‘LCAP’ … is more or less fictitious,” said Morgan Polikoff, a USC professor and member of a recent state accountability task force. The system is still in flux, as the state is developing the rubrics for judging whether districts have met their performance goals, while also designing a school-level accountability system to comply with ESSA, and trying to ensure the system as a whole is coherent. Under current law, there is a mechanism for California to intervene in districts that fail to meet performance goals for certain student groups in three out of four consecutive years. Such interventions would be at the discretion of the state superintendent and Board of Education and could not supersede union-negotiated contracts. The state rubrics for judging district-level progress will be finalized later this year, so it will still be several years before a district could face mandated state intervention. California has also created a new agency called the California Collaborative for Educational Excellence to continuously “provide advice and assistance” to districts. In Brown’s telling, teachers and schools have been descended upon by an army of “little busybodies to run down the halls and chide the teachers,” he told CALmatters, dispatched from Sacramento or, worse, D.C.
Larry Ferlazzo, a high school teacher in Sacramento and popular education blogger, said “without a doubt” he agreed with that perspective. “For too long and in too many places, decisions about education policy have been made without teachers being key players in that, and under Gov. Brown and Superintendent Torlakson, they’ve really changed that,” he said. California has avoided the fierce backlash to the Common Core standards that many states faced. While New York, for instance, has seen opposition from teachers and high testing opt-out rates, California has experienced virtually no opt-out movement and solid support from teachers for Common Core. Hitting pause on school and teacher accountability likely had something to do with that. But some say that the state has gone too long without a system for evaluating schools. Marshall Tuck, who narrowly lost a 2014 race for state schools superintendent, said he agreed with the initial break on accountability during the transition to Common Core, but that moment had passed. “This will be our third year where we’ll have no accountability system on the Common Core test … I think it’s too long a period of time,” said Tuck, who said he’ll “most likely” run for superintendent again in 2018. Ryan Smith, head of Education Trust – West, a California-based education and civil rights group, said the state can’t wait much longer for a meaningful way to hold schools accountable.